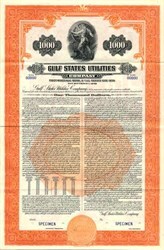 Beautifully engraved specimen certificate from Gulf States Utilities dated 1949. This historic document was printed by American Bank Note Company and has an ornate border around it with a vignette of a man turning a gear. This item is over 67 years old. Gulf States Utilities (GSU) was an electric power generation and distribution company headquartered in Beaumont, Texas. The company was founded in 1911 as Eastern Texas Electric, a holding company for Stone & Webster. 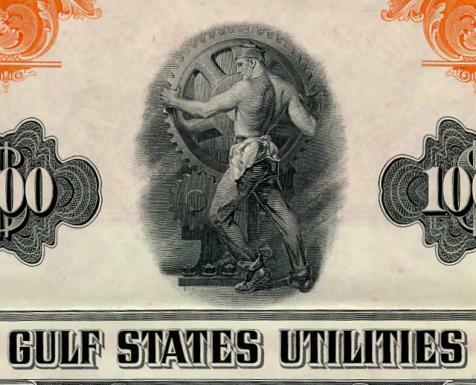 On August 25, 1925, Gulf States Utilities Company was incorporated in the state of Texas. The company grew, and in 1979 moved its headquarters into the Edison Plaza office tower, which is still the tallest building in Beaumont. Its older headquarters, the Liberty Pearl building (Formerly the Edson Hotel from 1929 to 1955), which still houses a lot of its telecomm equipment including the microwave radio systems, is still the second tallest building in Beaumont. Also in the late 1970s, construction began on the River Bend Station nuclear power plant. Cost overruns on the nuclear plant and a downturn in the regional economy in the mid 1980s nearly drove GSU into bankruptcy. In fact, trading of company stock was halted on the New York Stock Exchange one day as it tumbled down over 75% and eventually stopped at less than $2 a share. Former chief financial officer, Joseph L. Donnelly (who bore the nickname Orville Redenbacher because of his likeness to the popcorn king and always wearing a bowtie), has been credited with preventing the company from filing and ultimately was named its CEO. GSU was absorbed by Entergy Corporation January 1, 1994. At the time, GSU had 578,000 customers across southern Louisiana and East Texas. Edison Plaza was used by Entergy as its Texas headquarters. Joe Domino, a well-respected longtime employee who started as an engineer and later served as Sabine Station plant (near Bridge City) manager, is currently Entergy, Texas president. The River Bend Station continued to be a thorn in the side of its new owners due to lawsuits by the project's investors and fines levied by the Nuclear Regulatory Commission over safety problems at the plant. For a time, Gulf States Utilities was still a legally incorporated entity in the state of Texas. However, recently Entergy changed Gulf States' name to Entergy Texas, Inc. and merged its Louisiana service territory with its Entergy Louisiana unit.